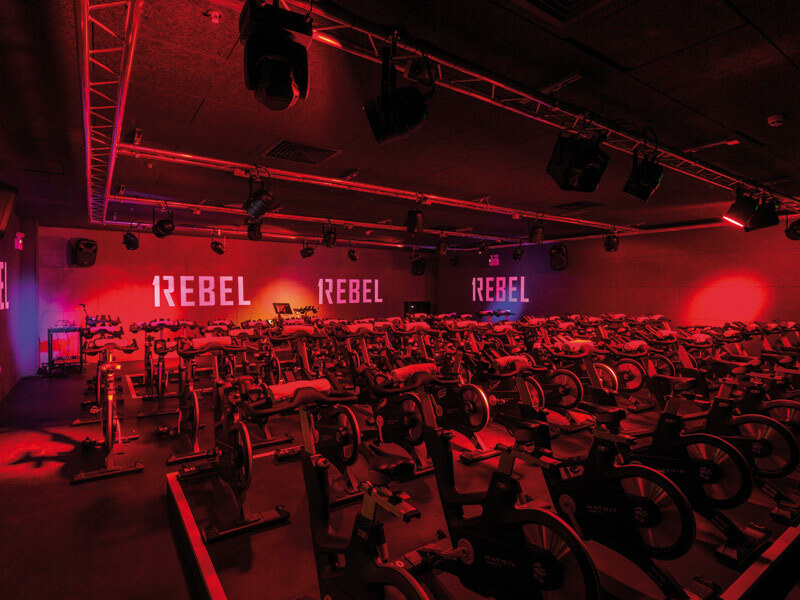 The City of London has acquired a new boutique gym thanks to Studio C102, which has completed the fit-out of 1Rebel on the ground and basement levels of 63 St Mary's Axe. 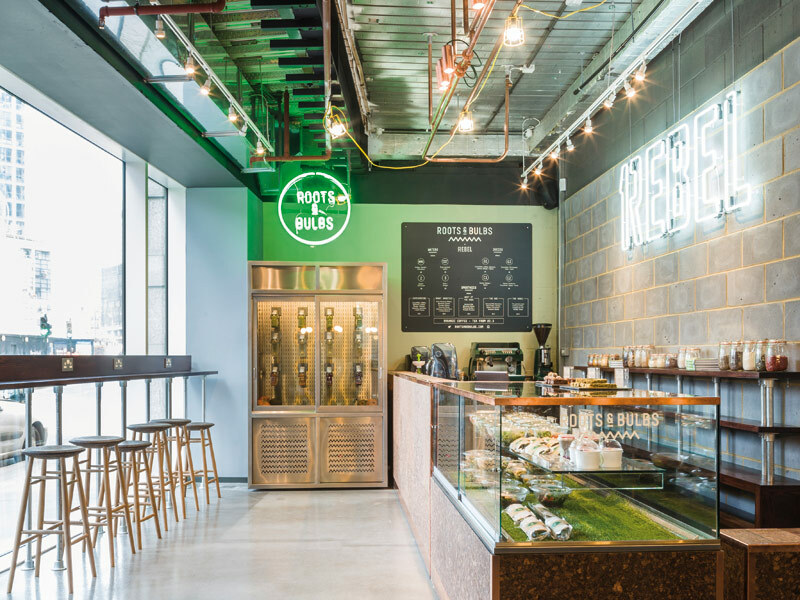 With the architecture practice set a design brief to include an industrial-looking aesthetic for the luxury workout space, the former offices now showcase as a contemporary 'theatrical' space that includes a shop and juice bar. Studio C102 started by stripping out the existing interior features to expose a concrete ceiling, ductwork and pipes. It opted for reclaimed industrial light fittings, sourced from a communist-era Polish ceramics factory and a German cargo ship from the Sixties to enhance the unfinished look. A mix of raw materials also features and includes unsealed steel, which will gain a rusty patina over time. It is a design scheme not usually associated with the luxury market sector or even a gym, but Studio C102 says it made for an 'interesting' brief. Creating a focus on merchandise, company products and customer experience was a client requirement too that also aided the luxury feel to the space. Studio C102 placed the shop at the gym's front entrance, at street level, with gym-goers passing the luxury sportswear ranges hanging from a clothes rail that snakes its way from floor to ceiling. In addition the studio delivered a scheme that creates a 'night-out' experience. 'Each [exercise] class feels like a night out and an event in its own right', says Katsaros, and Studio C102 opted for cinema-style signs to illuminate the entrance to the 'Ride' and 'Reshape' studios on the ground floor and basement levels. Exercise bikes in the 'Ride' studio sit on tiered levels and face a raised podium to mimic the layout of a theatre. Projections play on the walls to recreate a club experience, with music, sometimes from a live band, accompanying the workouts. A long bench made from white handcrafted tiles runs along one side of Ride studio and provides discreet storage for cycling shoes, provided by the gym for use on the bikes. The basement Reshape weights studio features Georgian wired mirrors with steel frames and bespoke gym benches. 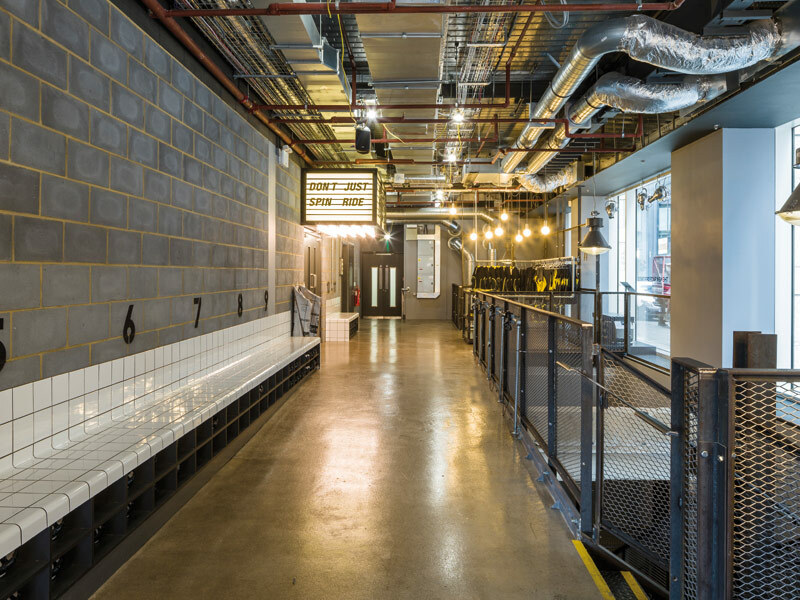 Consistent with the gym's 'edgy and urban' style, Studio C102 has continued its industrial luxe into the changing rooms, which feature the handmade, tiled and heated benches and SMEG fridges that contain chilled towels for post-workout use. 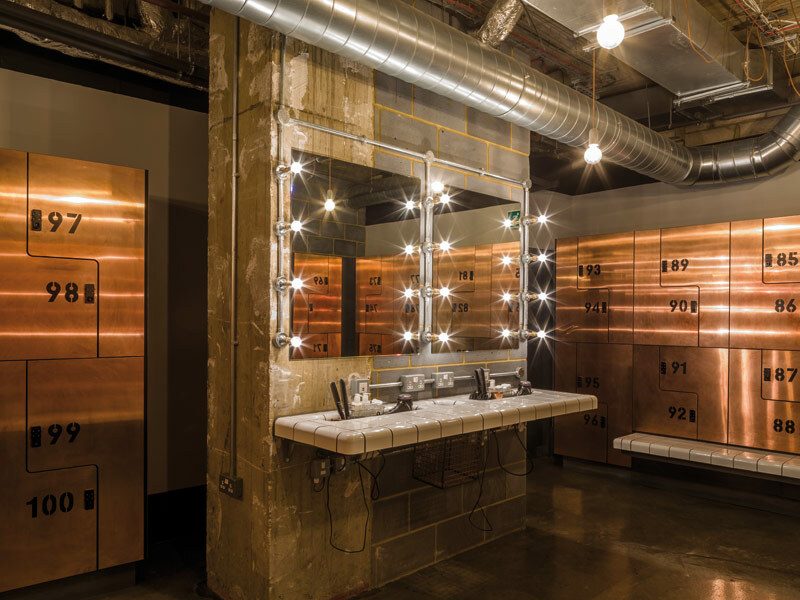 In the men's changing rooms, Hollywood-style vanity mirrors are paired with Fifties' barbers chairs, and a concrete lift shaft has been exposed. Other design elements include galvanised-steel lockers and LED filament bulb lighting in copper holders. The women's changing rooms are softer, with bespoke Deborah Bowness wallpaper and modern copper-panelled lockers. Here, the LED filament lighting hangs from the ceiling in concrete holders to complement the concrete floors, which were left exposed before sealing to give them a unique patina. Tasked with an interesting design brief Studio C102 has delivered an unusual and quirky project, which Katsaros summarises as 'industrial, yet luxurious and places the visitor at centre stage'.